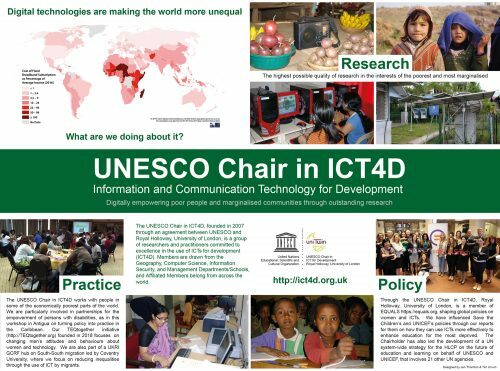 Members of the UNESCO Chair in ICT4D publish in a diversity of media and outlets. Some of our books, journal articles and chapters in edited books are listed below. Unwin, T. (2017) Reclaiming Information and Communication Technologies for Development, Oxford: Oxford University Press. Eades, G. (2015) Maps and Memes: Redrawing Culture, Place and Identity in Indigenous Communities, Montreal and Kingston: McGill-Queen’s University Press. Quaglia, E. and Smyth, B. (2018) Secret, verifiable auctions from elections. In Journal of Theoretical Computer Science, volume 730, pp. 44-92. Quaglia, E. and Smyth, B. (2018) Authentication with weaker trust assumptions for voting systems. In Progress in Cryptology – AFRICACRYPT 2018, volume 10831 of LNCS, pp. 322-343. Azer, E.,Harindranath, G. & Zheng, Y., (2018) Revisiting leadership in ICT-enabled activism, New Media and Society. Hassan, B., Unwin, T and Gardezi, A. (2018) Understanding the darker side of ICTs: gender, harassment and mobile technologies in Pakistan, Information Technologies and International Development, 14, 1-17. Unwin, T., Weber, M., Brugha, M. and Hollow, D. (2017) The future of learning and technology in deprived contexts, London: Save the Children International, 51 pp. Unwin, T. (2017) ICTs, sustainability and development: critical elements, Chapter 2 in Sharafat, A.H. and Lehr, W.H. (eds) ICT-Centric Economic Growth, Innovation and Job Creation, Geneva: ITU, 37-71. Hassan, B. and Unwin, T. (2017) Mobile identity construction by male and female students in Pakistan: on, in and through the ‘phone, Information Technologies and International Development, 13, 87-102. Mersinas, K., Hartig, B., Martin, K. & Seltzer, A. (2016) Are inforamtion security professionals expected value maximisers? : An experimental and survey-based test, Journal of Cybersecurity, 2(1), 57-70. Kromidha, E. (2016) Crowdfunding and social identity in Northern and Latin America, Proceedings of the 6th Latin American and European Meeting on Organization Studies, 6-9 April 2016 . Viña del Mar, Chile, 2016. Kromidha, E., and Cordoba-Pachon, J. R. (2014) Bridging the gaps between e-government practice and research: A meta-study for policy development, International Journal of Public Sector Management, 27(1), 66-84. Kromidha, E. (2012) Strategic e-government development and the role of benchmarking, Government Information Quarterly, 29(4), 573-581.